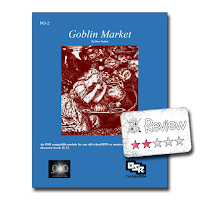 This week's Frugal GM Review is a PWYW adventure from QuasarDragon Games called Goblin Market (PO-2). This OSR adventure is designed for an unspecified party of PCs of levels 10-12. Goblin Market is a follow-on adventure to their adventure The Stolen Child (PO-1). ....and personally I wouldn't print this PDF out. The use of color throughout the file is garish at best...it really would be a waste of ink. The artwork used throughout the PDF is inconsistent and the use of color in the art is generally unneeded. There are a lot of colored text-boxes as well. 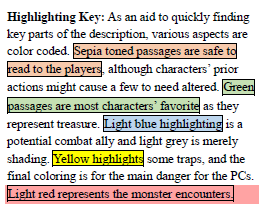 The thing is, if you want to use colored text boxes for important details, make it simple and use one color that won't waste the GM's ink. If you need to include a paragraph to explain what all the colors mean, then you've over-done it. Now this was just the initial overview....not even two minutes of cursory inspection. As I started reading the text it quickly occurred to me that the author really needed an editor. The adventure is rife with grammatical, spelling, and just some common-sense errors. Now to be fair, this isn't all that uncommon with early writing attempts and I'm still finding errors in my stuff because I don't have an editor. The thing is a lot of these could be fixed with a simple spelling and grammar check that pretty much every word processor has these days. In general I thought the writing was verbose and again, this is where and editor would be useful. Little gems like "Although barren, Vrovk Island is not lifeless. Numerous hardy plants, especially briars, a red,rock-climbing kudzu, and thorny scrubs grow here." can be found throughout the text. Barren means "too poor to produce much or any vegetation." Ugh.....things like this make reading difficult. Now some might consider this nit-picky, but one thing that usually bugs the heck out of me is not having good internal consistency within a document. Colored passages aren't always outlined, sometimes the font changes size for a paragraph, and there are too-many widows & orphans (bits of text from a larger paragraph or even a table separated from the rest of the paragraph or table). The adventure itself is pretty much a railroad. The initial setting of the town of Sligo is fine, but some of the encounters there seem forced, and progressing through the adventure requires the party to take a specific course of action. Up until that point the encounters are a bit on the vague side and while something does happen that the party might want to investigate, odds are they will have to be prodded to undertake this one specific course of action. The next encounter basically just "happens" along the way of this specific action. The rub is, that if the party does take this specific course of action then they really shouldn't stumble across this next encounter. The next couple of encounters just seem to happen as well. There isn't an overall area map, and there are no good explanations of how the GM is supposed to bridge the gap between encounters, so they feel like they just "happen". Between the verbose, inconsistent, error-filled text, and the garish use of distracting color, I'll admit I couldn't finish reading the adventure. My impression is that Goblin's Market would take a lot of GM work to bring this adventure up to spec for a level 10-12 party to be able to play in it. You might be able to take the basic idea as an adventure seed and work something up, but I don't think I'd ever run this as-is.